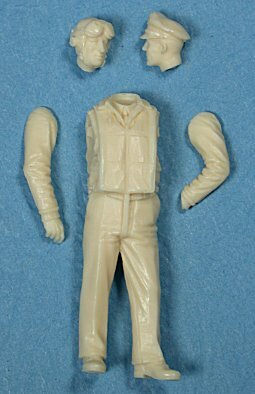 Advantages: Still a relatively rare and very welcome accessory for 1/48 scale USAAF aircraft modellers; casual and versatile pose; beautiful sculpting and attention to detail; good facial features, convincing uniform details. Conclusion: A lovely standalone figure or a great companion for your 1/48 scale aircraft. The pilot is wearing dress trousers with a leather flying jacket and Mae West life jacket. Two optional heads are supplied - one with a leather flying helmet and one donning an officer's cap. The figure was sculpted by Mike Good, and the quality is well up to his superb standards. I think that the face of the helmeted head bears a striking resemblence to Victor Mature. The pose is natural and versatile for an aviation diorama, or for use as a standalone display figure. Casting of my sample is perfect. The body and legs are cast as a single piece, with the arms and two heads supplied separately. This is another excellent addition to Ultracast's growing range of pilot figures. British or Commonwealth next, perhaps?